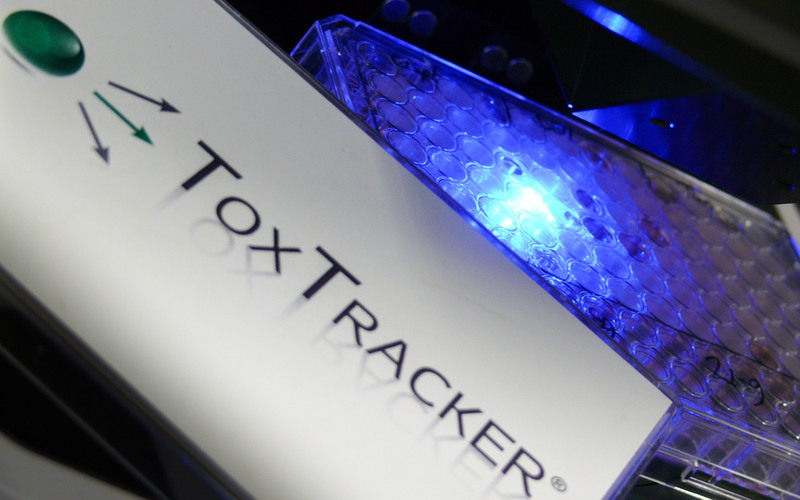 The ToxTracker assay is a state-of-the-art stem cell-based reporter assay that provides mechanistic insight into genotoxic properties of compounds. 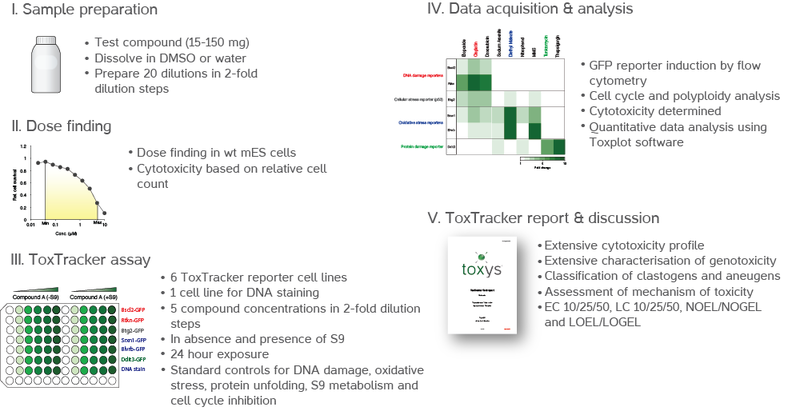 ToxTracker ACE (Aneugen Clastogen Evaluation) is an extended version of the ToxTracker assay and includes direct discrimination between an aneugenic and a clastogenic mode-of-action of genotoxic compounds. 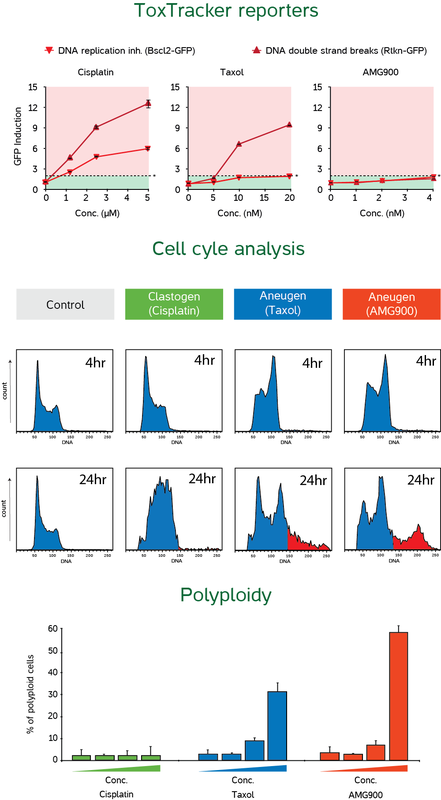 ToxTracker ACE combines the power of 6 fluorescent reporter cell lines for detection of DNA damage, oxidative stress and protein damage with cell cycle analyses and detection of polyploidy. This unique combination gives unparalleled mechanistic insight into the hazardous properties of chemicals and pharmaceuticals in a single assay. The information generated is particularly useful in Mode-of-Action (MoA) and Adverse-Outcome Pathway (AOP) approaches. ToxTracker ACE is an extended version of the ToxTracker assay and includes cell cycle analyses and polyploidy detection to allow direct discrimination between an aneugenic and clastogenic mode-of-action. ToxTracker ACE (Aneugen Clastogen Evaluation) combines the 6 fluorescent reporter cell lines for detection of DNA damage, oxidative stress and protein damage with a DNA staining for cell cycle and chromosome analysis. The combination of differential activation of these endpoints is a unique and very powerful means to separate clastogens from aneugens, as well as to identify potential tubulin poisons and cell cycle kinase inhibitors. We compared cisplatin (DNA cross linker), taxol (tubulin poison) and AMG900 (kinase inhibitor). This visualisation illustrates the sequence of events between receiving your test compound, performing the ToxTracker ACE and providing the final results. 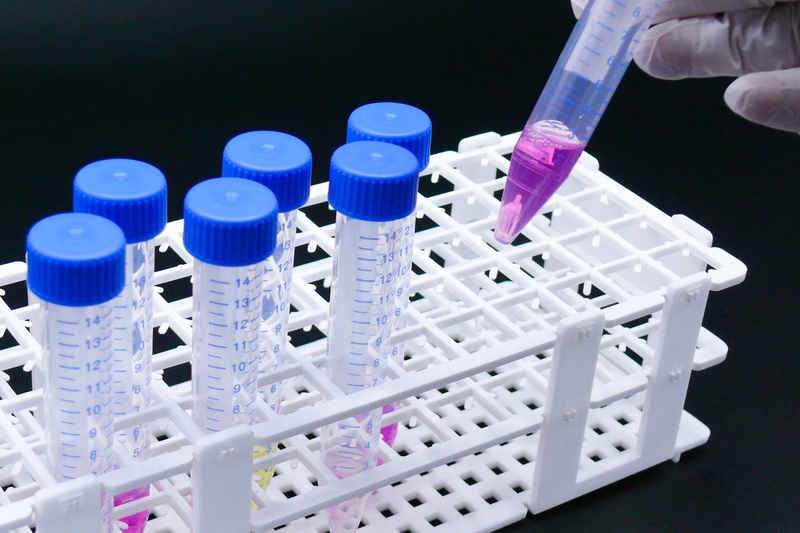 Toxys has made its ToxTracker ACE assay available through the research service marketplaces Science Exchange and Scientist.com. These platforms are used worldwide by large and small companies to source their testing services. Organisations listed as buyers can now make use of the standardised legal agreements of these platforms and efficiently order ToxTracker services. Toxys is a Dutch biotech company that provides innovative in vitro toxicity screening solutions to rapidly identify hazardous and potential carcinogenic properties of novel compounds during the early phases of product and drug development.